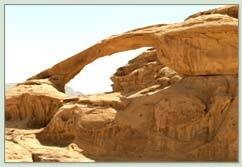 Wadi Rum, also known as The Valley of the Moon, is a valley cut into the sandstone and granite rock in southern Jordan. It is the largestWadi in Jordan. Wadi is the Arabic term traditionally referring to a valley, the name Rum comes from the meaning 'high' or 'elevated'. To reflect its proper Arabic pronunciation, archaeologists transcribe it as Wadi Ramm. 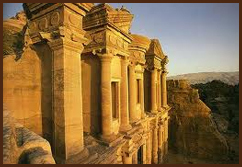 Petra meaning stone, is an ancient city located in the country of Jordan. It was established sometime in the 6th Century BC by the Nabataeans, and was carved out of rock around 1200 BC, and is located on the slope of Mount Hor, which is supposedly where Moses' brother Aaron was buried. The Treasury, its most famous structure, is estimated to be 2000 years old. 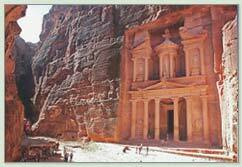 Nabataeans prospered by controlling water supply in the region. They used structures like dams to store and sell water from flash floods. The city was captured by the Romans around AD 106 and became part of the Arabian Province. Parts of the film Indiana Jones and the Last Crusade by Steven Spielberg was filmed here!